Your one stop for all your companion bird's needs! A family owned business, for over 35 years Bird Paradise loves birds. With over 20,000 toys, 150 bulk food items, 10,000 cages in our 20,000 sq. 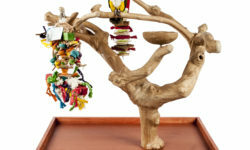 ft. store you will find our large selection of healthy and fun supplies for your pet birds. 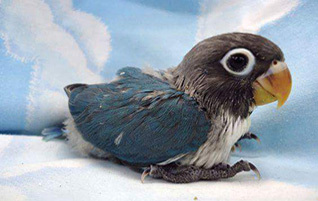 If you are looking for a companion bird who is DNA’d and tested for Psittacosis, PDD, PBFD and Polyomavirus then our friendly staff of avian experts are ready to assist you with finding the appropriate baby to join your family. 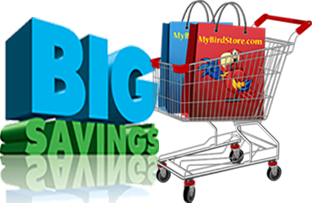 Find quality pet bird supplies here at low prices. 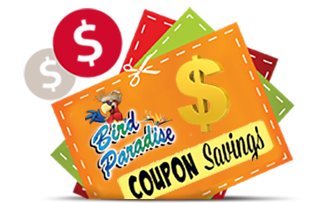 Shop at Bird Paradise for a fun family day and low low prices. For the best hand fed birds, Bird Paradise is your best choice. The World's Best bird food is packed with a powerhouse of natural ingredients and bee pollen. The Java Tree is a natural tree perch made from a single coffee tree of 25 to 35 years of age when the tree becomes non-productive. 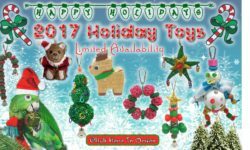 Quality toys made in the USA for parrots and all exotic birds.